" The chart did not go back to 1981 so I could not do that year." Here is a good source for those kind of data: http://www.usgovernmentspending.com/spending_chart_1981_2013USp_13s1li011lcn_F0fF0sF0l_US . Their data go back to 1792, so it should do the job most of the time. I've put the evolution of inflation adjusted total government spending since 1980 below, there's indeed one very noticeable jump. Drum uses inflation adjusted spending per capita, but that doesn't make much difference in this context. Once again, I argue against using the ratio of federal spending (FS) to gross domestic product to compare trends. 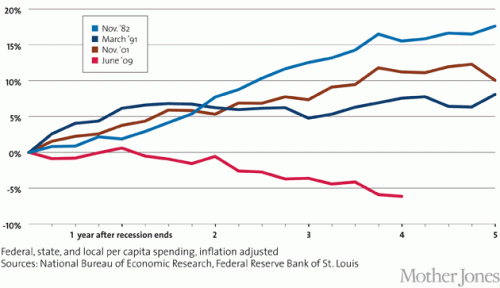 Federal spending and GDP are only minimally related. When our economy is booming, the GDP rises. This improves the FS/GDP ratio with no change in government spending. 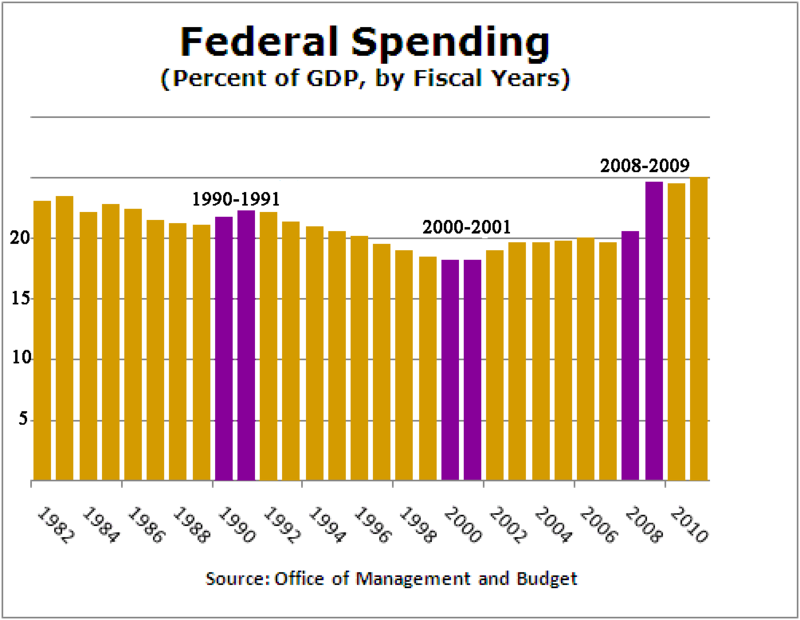 Time trends of federal spending should be adjusted for three things: inflation, spending increases due to demographic changes (eg: more people over 65), and changes in total population (using an empirical rule such as a 1% change in population corresponds to a 0.2% change in federal spending). This approach takes more work now, but the creation and distribution of tables with these values would make it easy to show trends. Can you even see the sequester in that chart? unadjusted for population growth, the spending increase is approx 300%, adjusted for inflation and population growth, the spending increase is approx 200%. But, Pelosi said the spending cuts from the sequester have level the cupboard bare. Yep, total government spending went from just under 10k per capita to a little under 20, with federal spending going from $5679 per head in '81 to $10195 this year (all nrs in 2005 dollars).